Around the world, quadcopters are turning into mail carriers. Drones have been in the delivery business since they were invented, delivering data, imagery, and, more recently, ordnance. But two years ago on “60 Minutes,” when Jeff Bezos showed a warehouse full of drones stamped with the Amazon arrow and announced half-hour commercial delivery by as early as 2017, the possibilities for cargo drones seemed to instantly expand. What didn’t expand was airspace. Under today’s Federal Aviation Administration regulations, operators may apply for a Section 333 Exemption, which allows them “to perform commercial operations in low-risk, controlled environments.” Significantly, the rules bar operators “from allowing any object to be dropped from” a drone. 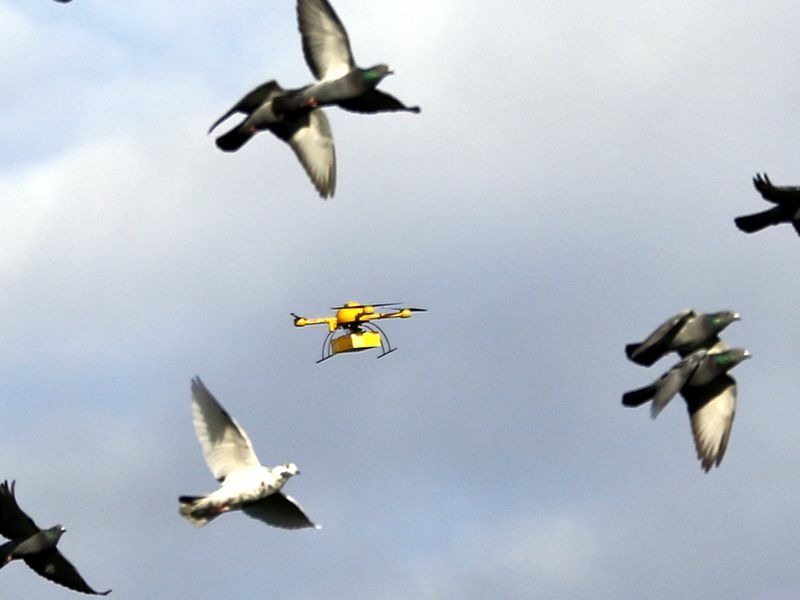 So how plausible are delivery drones, really? Flying packages in an urban area is fraught with challenges: Go too high and the drone could interfere with an airliner’s airspace; too low and it has to navigate around buildings and trees—not to mention people who would like to snag a drone in addition to its package. The hazards haven’t stopped dozens of companies from running trials—or staging publicity stunts. You decide which of the following is which. Would You Like That on the Rocks? Timbré, a Singapore-based restaurant chain, hopes to expand its workforce to include drone waiters by the end of this year. The chain, in partnership with Infinium Robotics, conducted trials in February. 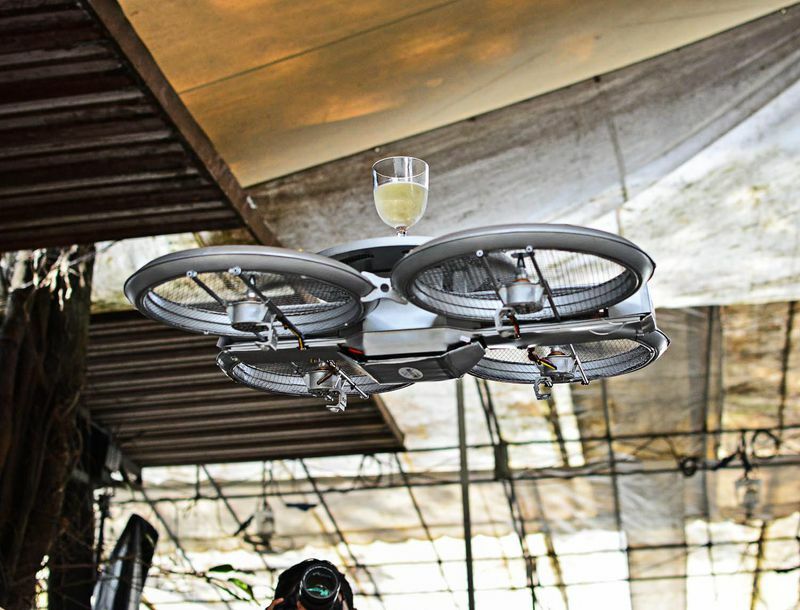 Drones (unimaginatively named “Infinium-Serve”) will transport food and drink from the kitchen to the dining room, where human waiters will deliver them to patrons. The drones are equipped with sonar sensors and stereo-vision cameras, says Junyang Woon, chief executive of Infinium Robotics. (Woon declined to give specifics about the positioning technologies needed to enable the drones to work without slamming into people, explaining that the company was in the middle of filing patents.) Eight drones, at a cost of $20,000 to $60,000 each, will be used in each of Timbré’s five restaurants. The technology took more than five years to develop, says Woon, and is used with a multi-rotor platform also designed by Infinium. Sound like a gimmick? Both Infinium and Timbré have mentioned that the impetus of the project was Singapore’s labor shortage. The nation’s residents shun food-and-beverage service, notes a 2012 report by the Asia-Europe Foundation. Many of the positions are filled by foreign workers, who make up 40 percent of Singapore’s workforce. But in the past two years, “we have encountered a severe manpower crunch due to the tightening of foreign worker policies,” Edward Chia, Timbré’s managing director, told the BBC in February. As an incentive to compensate with drones, businesses that automate jobs also receive government subsidies—up to 70 percent of technology costs.